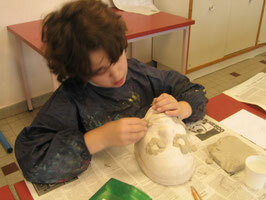 ‘Azur et les Aéroplanes’ offers both mask making and puppeteers making workshops on Wednesdays. Although these workshops are primarily designed for kids between 8 and 12, we encourage parents to accompany their child. Inspired by the rich European heritage of mask making, this workshop aims at designing and shaping your own cellulose mask using a clay mask as a base. Each session has a theme in relation with the European mask-making tradition and the season in which the course is scheduled. Traditions linked to the return of the spring season and to the revival: devils, witches and young brides. Azur et les Aéroplanes offers as well, puppets with paper girdle making workshops for kids from 8 to 12 years old. 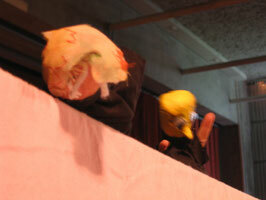 This training give rise to introduce kids to traditional tales, which feed puppetry creation. The cycle will end to a game session with puppets and children’s party. Tariffs and schedule are the same as mask training. Tradition of spring season back and of the revival: devils , witches and young brides. Wednesday the 3rd, 10th, 17th, 24th, 31st of march and 7th of April. Wednesday the 5th, 12th, 19th, 26th of may and 2nd, 19th of June.